NORMAL — The fifth annual WILLAg.org FM Farm Assets Conference, held Nov. 20 in downtown Normal near the campus of Illinois State University, brought together Illinoisans engaged in a wide spectrum of agricultural endeavors — along with those in supply chain industries — for a full day of fraternization, education and achievement recognition. Highlights of the Farm Assets Conference, formerly known as the Illinois Commodity Conference, included a panel of supply chain representatives explaining ongoing opportunities and premiums available for farmers and ranchers who enter into contractual production contracts with companies like McDonald’s and Anheuser-Busch. Other highlights: A panel of University of Illinois economists and researchers examining trade, tariffs, grain flow and the farm economy, and the WILLAg Commodity Marketing Panel. Hosted by WILLAg’s Todd Gleason, the conference also featured an update on the growing number of new ag-tech startup companies leasing space at the University of Illinois Research Park, along with a luncheon. 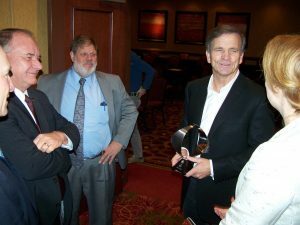 The event was preceded by the annual meeting of the Illinois Corn Growers Association, during which members elected new officers and handed out awards to farmers and friends of agriculture. An Elmwood farmer has been elected president of the Illinois Corn Growers Association during its 2018-19 reorganizational meeting, held prior to the WILLAg.org FM Farm Assets Conference. Ted Mottaz had been a member of the ICGA board for six years, most recently as vice president. Joining Mottaz in leadership roles are vice president Bill Leigh of Minonk, treasurer Matt Rush of Fairfield and secretary Dave Rylander of Victoria. District directors were also elected, including farmer-leaders Randy DeSutter, Terry Smith, Don Guinnip and Joe Murphy. Re-elected at-large chairmen were Kate Danner of Aledo and Rylander. In addition, the ICGA exports committee will be led by chairman Marty Marr of New Berlin and vice chairman Guinnip. The industrial committee will be chaired by Randy DeSutter of Woodhull and Mike Homerding of Plainfield, while the grassroots committee will be led by Aron Carlson of Winnebago and Terry Smith of Clayton, the ICGA announced. Mike Adams, radio broadcaster for the syndicated program Adams on Agriculture, was named the 2018 Excellence in Media award winner at the ICGA annual meeting. Congratulations Mike! Greeting well-wishers in the media room following his recognition by ICGA officials, Hennepin ethanol producer Mark Marquis, owner of Marquis Energy, said he was excited about being receiving the Ethanol Award at the ICGA annual meeting in Normal. Beginning as a 100 million-gallon-per-year ethanol facility in 2008, Marquis Energy has grown to become the largest dry-mill ethanol facility in the world with a production capacity of 1 million gallons of fuel-grade ethanol per day. Marquis also serves on the board of directors of Growth Energy and chairs its export committee. A member of the Illinois Renewable Fuels Association board, Marquis is regarded as a strong voice for ethanol at the state legislative level. Fandel teaches agriculture and conducts research at the ICC East Peoria campus, and has served as a cover crop specialist for ICGA. He is active on several committees charge with issues related to soil conservation, water quality and sustainability. He was formerly employed by University of Illinois before coming to ICC. Agriculture-based technical start-up businesses are leading the way in new innovations coming out of the University of Illinois Research Park, the business incubator’s associate director told a packed house during the WILLAg.org FM Farm Assets Conference. Calling ag-tech the fastest growing sector, Laura Weisskopf Bleill noted that there are currently over 120 companies employing 2,100 employees at Research Park in Urbana, with more than 800 U of I students employed year round. New ag-tech startups that have located in Research Park include Agrible-Nutrien, Earth Sense, LifeFoundry, AirScout, EIWA, Farm Afield, and more. They join established companies such as John Deere, Dow Agrosciences, ADM, In-Bev, CME Group, Syngenta and others working in or on the edges of the agriculture industry. The new companies will be spotlighted during the U of I Research Park’s annual open house, to be held March 6, according to Bleill.